Update 2016-02-02: Updated to reflect Linux + Krita workflow. Update 2014-02-22: Updated to reflect current ScanSnap workflow and link to resources for sketchnoting with Autodesk Sketchbook Pro. tl;dr summary: I use Krita on Ubuntu Linux on a Lenovo X220 tablet PC to do my sketchnotes. I also scan in sketches that I do on paper. Here’s a quick comparison of how and what I draw on paper, tablet, and my Lenovo X220 tablet PC, and what works out better when. Lightweight, large-scale, and no worries about battery life or device drivers – hard to argue with paper’s advantages. I don’t have to worry about digitization errors when I’m writing small text, and I don’t have to swipe or scroll in order to see the rest of my drawing. I can see everything in context. On paper, though, I can’t erase ink or move images around as quickly as I can on the tablet or tablet PC. Since I don’t have layers, I can’t change my mind about colours. I often end up smearing ink, too. I have a hard time finding pens that will give me a consistent fine line. Scanning introduces several additional steps. I’ve had the best experience with 8.5×11” loose sheets of paper in a stiff folder (or on top of another firm surface), because they’re easy to draw on and scan. I carefully tear the pages out so that I can pass them through my ScanSnap sheet-fed scanner. Ballpoint pens are too rough and uneven. I prefer 0.4mm technical pens or gel pens like the Pilot Hi-Tec C4. I’d love to find a super-fine inexpensive fountain pen. For colour, the markers I have are a bit dark. Coloured technical pens are fun. Highlighting can be iffy, so I usually do that on the computer instead. I like drawing on my tablet screen with a stylus. It’s quick, it’s responsive, and it lets me erase, colour, or move things until I’m happy with how the drawing looks. I can work with as many layers as I want, and I can hide or reorder them easily. I can add background grids or reference images, then make them disappear when I’m ready to publish. Posting the sketchnotes to my blog is easy, too. I export the files to my Dropbox folders, and then I post things to WordPress. On Microsoft Windows, I like using Autodesk Sketchbook Pro. On Linux, I like using the Krita app. Autodesk Sketchbook Pro has a very pen-friendly interface, but Krita is pretty okay too. 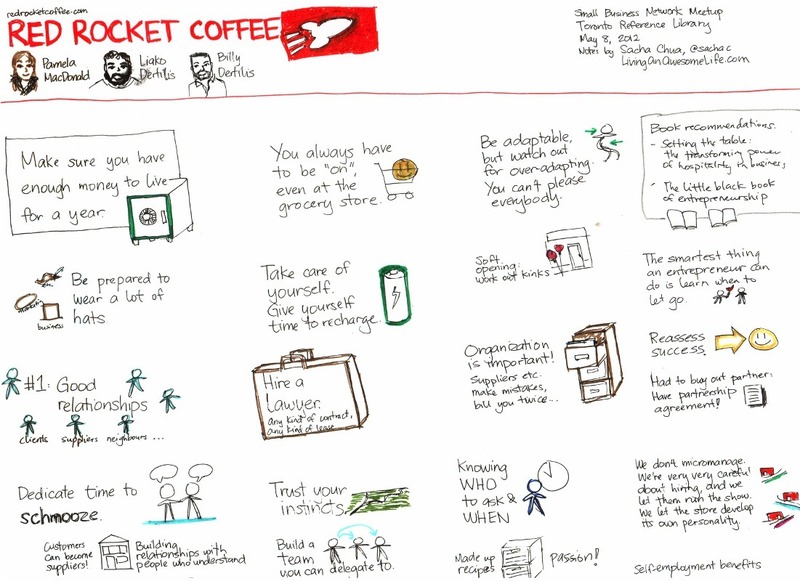 I used to use Microsoft OneNote 2010 for drawing sketchnotes, but after several annoying incidents where it messed up my drawing by moving brushstrokes around, I gave up on it. 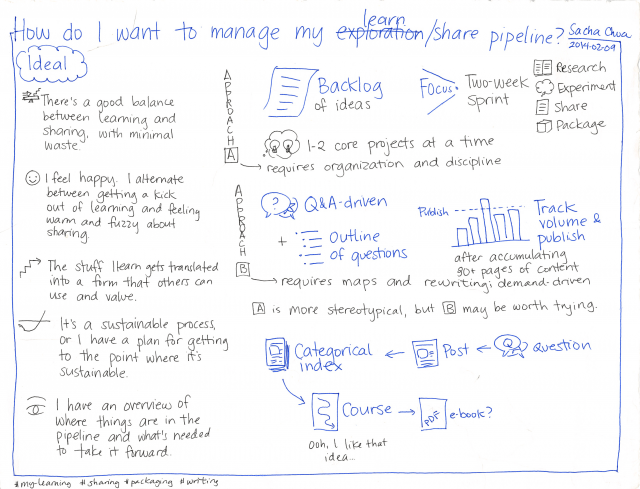 Also, the infinitely scrolling page was great for input but not so much for output – hard to include in blog posts or print out in a coherent way. Hope these notes are useful, and that you’ll also have fun drawing! In terms of portability, the tablet is a good compromise between paper and the tablet PC. It’s lighter and has more battery life than my tablet PC, while still giving me the digital advantages of drawing in pixels. The TF700 has more screen resolution than my laptop, even, and it’s handy for reviewing and searching my sketchnotes using Evernote as well as drawing them with Autodesk Sketchbook Pro. I’ve tried several drawing apps, but only Autodesk Sketchbook Pro seems up to the challenge of handling several layers on a high-resolution display. Even with that, though, I think I can only add five layers before things get wonky. I’ve mysteriously lost parts of drawings because of partial autosave recoveries, which is a pain, and the app doesn’t have a Lasso tool for moving parts of a layer around. I really should invest some time into making custom grids that exactly fit my resolution, too. Certainly more innovation needed in this area. The Nomad Brush stylus seems to make my drawing applications lag quite a bit, so I’ve found myself doing most of my drawing with my finger. It’s easier to do other gestures as well, such as swiping to scroll or pinching to zoom in. Drawing on the tablet is more tiring than drawing on my tablet PC because I have to make sure my palm doesn’t touch the device and because I’m using an imprecise pointer with more friction, but it’s okay for an hour or so of recording. I spend much of my drawing time zoomed in so that I can draw text, so I don’t have the whole-drawing context that I get with paper. It’s much easier to zoom and pan with the tablet than with the tablet PC, though. Not having a lasso or cropping tool, I sometimes end up with too little or too much whitespace. I could edit the images on my laptop afterwards, but I rarely get around to it. I’m still getting the hang of the workflow. 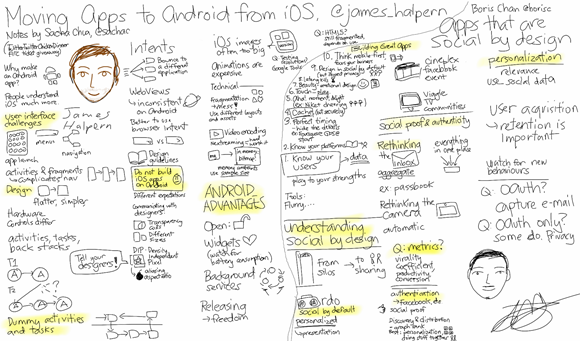 Twitpic appears to be the best way to post sketchnotes to Twitter because it will keep the full-resolution image. I’ve set up Postie for WordPress so that I can e-mail the PNG to my blog and have it posted as a thumbnail that links to the full-resolution image, although I haven’t fully automated it yet. I still prefer Windows Live Writer on the tablet PC for writing blog posts that combine images, text, and links, but Postie will do in a pinch. 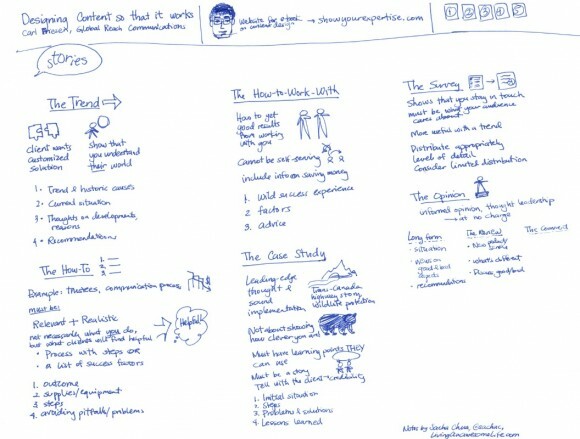 Evernote is fantastic for searching and looking up sketchnotes. It doesn’t have a slideshow view, though, so I also save the files in Dropbox and use either Perfect Viewer or Gallery to flip through my sketches in quick succession. I take my tablet instead of my tablet PC to meetups now. The tablet is easier to slip into my bike bag, and I can use it to support conversation. The tablet PC is heftier and much harder to use while mingling. 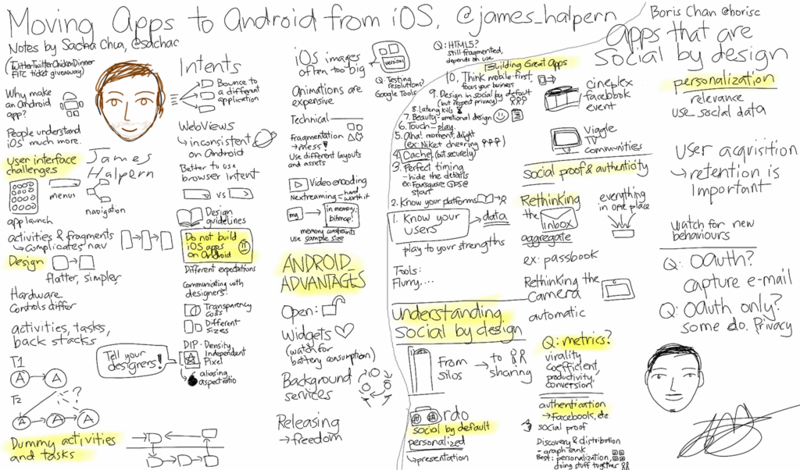 I think my handwriting’s a little looser and coarser on the Android. Less control, less familiarity… Still, it’s legible, and that’s mainly what I’m going for. Thanks to Noorul for the nudge to write about this.